As background information, the segment of Pembina Highway which lies south of the La Salle River Bridge underwent a speed limit review in 2017. 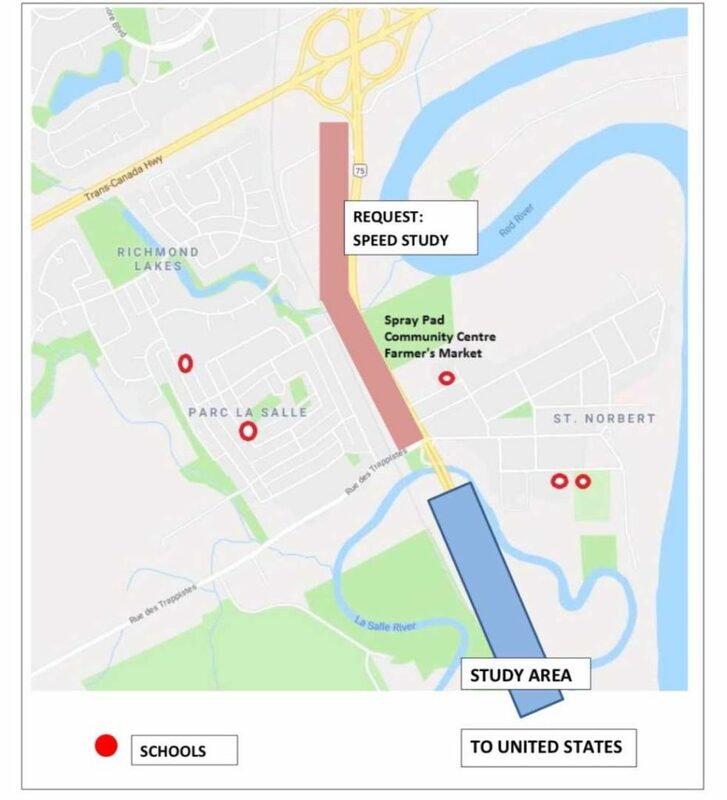 Winnipeg’s Public Service Report on Speed Limits on Pembina Highway South of the La Salle River Bridge is recommending to increase the existing speed limit from a 60 km/h zone to a 70 km/h zone (blue area in image), subject to public engagement and approval by the City’s Standing Policy Committee on Infrastructure Renewal and Public Works (SPC-IRPW). A public engagement was held on November 30th in St Norbert and the Public Engagement Survey Results were presented to SPC-IRPW. It is important to note results are not statistically relevant but are intended to provide insight into levels of support and respondent rationale. The public consultation highlighted many valid points. PTH 75 is a key commuter corridor for residents living in southern Manitoba. PTH 75 is Manitoba’s primary economic trade corridor into and from the United States requiring multi trailered semi’s to pass through St Norbert. The city of Winnipeg’s 2015 Traffic Flow study indicates over 20,000 vehicles enter into St Norbert daily. Residents and I would like to see a more comprehensive study of speed before any final decisions are made. I have long worked in the field of active transportation and the vulnerable road user for over a decade, and am very rarely a supporter of increasing speed. I requested that a speed study be conducted in St Norbert from the La Salle Bridge to the Perimeter Highway. The motion was approved by the committee and reads: That the Winnipeg Public Service be directed to report back to the February 27, 2018 meeting of the Standing Policy Committee on Infrastructure Renewal and Public Works with a course of action, working with various stakeholders, on a strategy for a speed study in the area from the Perimeter to the La Salle Bridge. I believe it is important to understand what speeds the Semi’s and vehicles entering INTO St Norbert are travelling so an informed decision can be made. Perhaps the North bound PTH 75 speed limit should remain at 60km/h vs increasing to 70 km/h south of the La Salle. Perhaps the speed study will indicated the need for traffic calming devices to be installed in St Norbert. Perhaps the study will indicated there is no speed issue in St Norbert. I expect the speed study will occur in either Spring or Fall of 2018. The SPC-IRPW approved the report’s recommendation to increase the speed limit from 60km/h to 70km/h (blue area) for BOTH north and south bound PTH 75 traffic south of the La Salle Bridge. This approval will trigger a letter to the Province indicating Winnipeg is supportive of increasing the speed limit. The City of Winnipeg now sends the SPC-IRPW recommendation to increase the speed limit to the Province of Manitoba, who then will hold another public hearing to consider input. The Province of Manitoba ultimately determines if the limit will be increased. I am hoping the Province will wait till the City of Winnipeg completes the speed study in the town of St Norbert before any final decision is made. MLA Jon Reyes will be able to provide details on when the Provincial Public Hearing will be held. If you have any feedback, please contact MLA Jon Reyes.